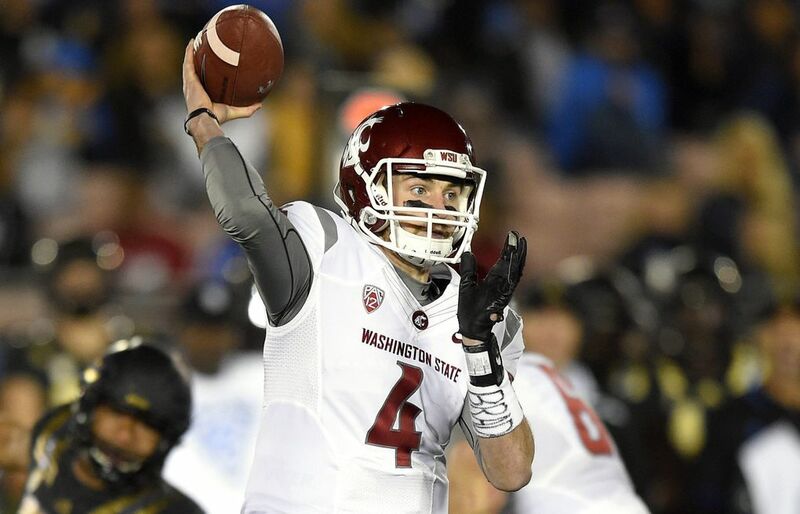 WSU quarterback Luke Falk comes from a goal-oriented family, so it comes as no surprise what you’ve seen this season is the result of years of preparation. In his quest, Falk has embraced modern science and natural medicine to help him meet the demands of playing in the Pac-12. When Luke Falk was about 10 years old, he and his older sisters, Alexa and Natalee, sat down and crafted their first vision boards. Inspired by the 2006 movie “The Secret,” which espoused the idea that a person’s desires can be fulfilled by believing ardently in a specific outcome, the Falk children used their vision boards in the same way: putting up pictures of their dreams and ambitions, and making new boards every year. The Falks have always been goal-oriented. At the end of every year, Mike Falk, Luke’s father, made it a point to ask the family to think about how close they’d come to accomplishing that year’s goals, and what new goals they wanted to set for the coming year. Even as teenagers, the Falk sisters were already pursuing careers in country music, and their annual vision boards depicted music stars like Shania Twain and Keith Urban and showed cut outs of their faces pasted onto the bodies of stars walking the red carpet or being interviewed by Oprah Winfrey. As a boy, Luke’s vision boards expressed his desire for athletic success and the goal of earning a college athletic scholarship. But more recently, his vision boards have depicted scenes of success at WSU, the NFL and New England Patriots quarterback Tom Brady. 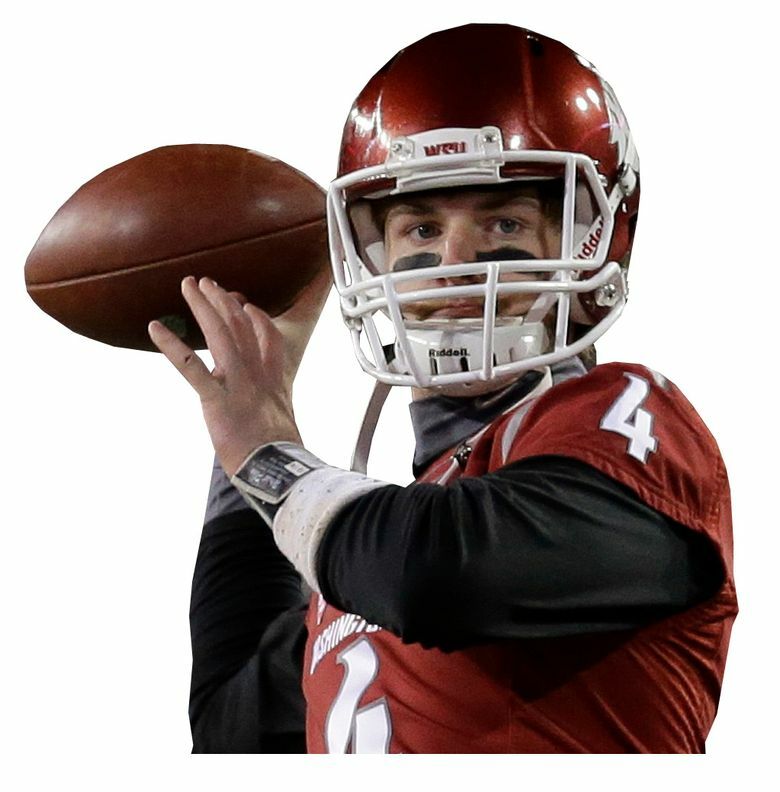 From that standpoint, it comes as no surprise what you’ve seen this season – the cool, unflappable Washington State quarterback who’s already set season records for touchdown passes and completion percentage – is the result of years of meticulous preparation geared toward a single goal. Now on the mend from the concussion he suffered against Colorado on Nov. 21 that forced him to sit out the Apple Cup, Falk is back on the field and preparing to face Miami in the Sun Bowl on Dec. 26. Falk has long modeled himself after Brady. However, Falk’s admiration for Brady goes beyond a respect for his body of work on the field. Like Brady, Falk has looked to sports science as a way to hone his body for on-field performance. The Cougars quarterback has worked closely with a sports scientist since he was in high school. He also judiciously monitors his sleep patterns, logs a record of everything he eats, follows the Bulletproof Diet — which emphasizes natural sources of protein, vegetables and good fats, and eschews carbs and processed foods — and checks in regularly with a Utah-based chiropractor and acupuncturist whom he credits for helping keep his body in tip-top shape. In his quest to fulfill the dream laid out on his childhood vision boards, Falk has embraced modern science and natural medicine to help him meet the demands that come with being the quarterback of a Pac-12 Conference team. Many elite high school athletes today work with personal trainers and strength coaches to prepare themselves to play in college. But Dr. Matt Rhea is not your average strength coach. Rhea has a Ph.D. in exercise and sports science, and he runs a private conditioning and sports science company whose clients include the Pittsburgh Pirates and the Miami Dolphins. Rhea first started working with Falk when he was the strength coach of the Logan High football team during Falk’s junior and senior years, and he introduced the quarterback to the world of sports science: where a close monitoring of sports nutrition, sleep patterns, sleep quality and psychology related to sports performance can yield data that helps athletes understand their bodies better. Rhea worked with Falk almost daily from his junior year of high school through when he left Utah to start college at WSU. From the beginning, Falk struck Rhea as a special talent who demonstrated extraordinary focus and uncommon grit. “Physically, he’s gifted, but the way his mind is wired completely different from your average athlete and average person,” Rhea said. “His drive to reach his goals is unmatched among any athlete I’ve ever worked with. For a five-month span leading up to Falk’s senior season at Logan High, he trained twice a day with Rhea, completing what the sports scientist calls “very intense workouts” designed to put the body through the demands of a football game. The long sequence of plyometric and resistance-based exercises might include movements like squats, power cleans, or dumbbell work, and throughout the workout, Rhea was constantly monitoring Falk’s physiological data, examining factors like heart rate and heart rate recovery. “We’d keep pushing things until there were physiological signs that a workout needed to end,” Rhea says. Based on research showing that longer hours of good quality sleep can enhance athletic performance, Rhea got Falk interested in tracking his sleep patterns, and that’s something Falk still does today with the help of a smartphone app and a FitBit. “It shows how many times I’m restless or how frequently I wake up. I get as much sleep as I can, especially with the stuff I just dealt with,” Falk said, referring to his recent concussion. To enhance his sleep quality, Falk sleeps wearing earplugs and shoots for at least nine hours of sleep a night, though he prefers 10. Falk then analyzes his sleep data to look for trends between that and his athletic performance, sometimes consulting Rhea for help interpreting what he sees and suggestions as to how he can use it to his advantage. He’s quick to make changes, too. Right after Rhea mentioned earlier this season that research has shown that a short nap in the middle of the afternoon can result in increased quickness and reaction time, a 30-minute nap started to show up in the quarterback’s daily sleep data. Rhea got Falk interested in sports science, but he has his mother, Analee, to thank for his belief in holistic medicine. Analee has been found to be “chemically sensitive,” meaning her body doesn’t respond well to chemical drugs and pesticides. That, coupled with the fact that her father died young from diabetes, has cultivated her interest in clean eating and natural medicine – traits that she has instilled in all three of the Falk children. Falk sees his mother’s acupuncturist and chiropractor in Utah every time he’s home. He gets a blood test there about every six months, and the results are analyzed to determine if he’s lacking in any specific nutrients. The chiropractor ensures his body is in proper alignment, while acupuncture helps release muscle tension and is known to cleanse the body of toxins. That acupuncturist also got Analee and Luke onto the Bulletproof Diet. Luke’s big on eggs, avocado and bacon at breakfast, but avoids processed sugars as much as he can, though Natalee and Alexa swear their brother will sometimes cave and devour a pizza when the occasion calls for it, or eat any cookies they send him. Falk is also a believer in the powers of essential oils. Ever since his redshirt year when he was playing Thursday Night Football – the WSU rite of passage for younger and developing players – Falk got into the habit of using frankincense oil before every offensive drive. Frankincense is considered a holy oil that’s referenced in the Bible. The Falks aren’t religious, but Luke was introduced to frankincense and essential oils by his sister, Alexa, who is a sales rep for an essential oils company. During games, one of the WSU equipment guys holds on to Falk’s Frankincense oil, and before every drive he puts some of the oil under his nose. After Falk’s concussion, Alexa gave him a massage with ylangylang, lemon, Frankincense and an oil blend called serenity, which helps relieve tension. She’s also gotten him into lavender and peppermint, which is believed to have a calming effect. Every athlete finds his own path to success, and Falk is forging his. Does the sports science data analysis, essential oils, nutrition plan and natural medicine help? Falk believes they all play a part in their own little way. They’re tools he’s harnessing to help him get to where he wants to end up. Falk still has the vision boards he’s made throughout his childhood. Most of them are displayed in his room in Pullman, and he usually makes a new one every year. The idea is that by creating vision boards of specific goals, you keep your ambitions in plain sight because thinking about what you want and seeing it on a daily basis can help you reach those goals. A few weeks ago, Falk was hanging out with his mother and sisters when one of them commented that he needed to be more specific on his vision board. They were referring to a scene on one of his more recent boards that depicted winning a big game in the Rose Bowl. The Cougars had just done that, knocking off No. 18 UCLA in Pasadena, Calif., on Nov. 14. After all, if this WSU season was any indication, sometimes visions can indeed become reality. 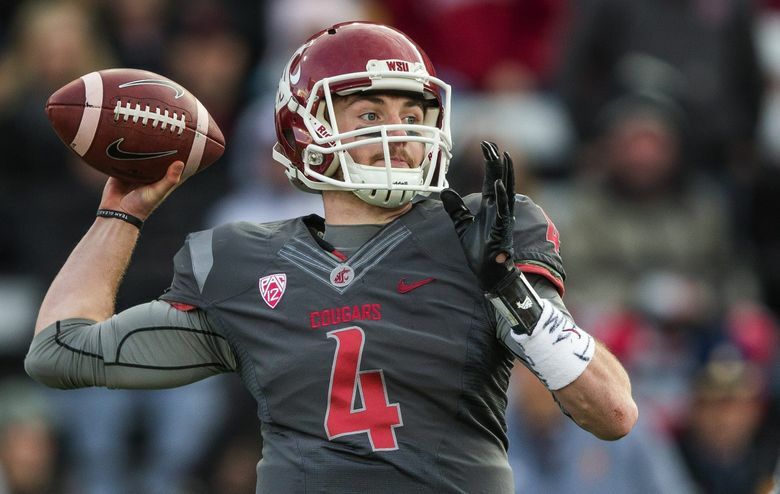 Falk appeared in six games in 2014, starting the final three games for an injured Connor Halliday.